Learning institutions in various forms have existed for centuries in the Muslim World, the earliest of which are, al-Qarawiyyin, al-Azhar and al-Qayrawan. This short article traces the emergence and spread of madrasas as a popular form of institutionalised education that has long existed in Muslim lands, and provided education to more than just the elite of society as was the case in much of Europe. Figure 1. 13th century illustration of a sermon in a mosque from the assemblies of Harîrî. Image copy right from: 1001 Inventions: Discover the Muslim Heritage in Our World. Chief Ed. by. Salim T S Al-Hassani, Manchester: FSTC, 2006. It is already known that institutions such as al-Qayrawan, al-Qarawiyyin and al-Azhar, above all, were amongst the first universities in history. Another great body of institutions initiated by the Muslims were the Madrasas, or colleges , of which Ibn Jubayr (d. 614H/1217 CE) counted thirty on his visit to Baghdad. Before we take a close look at a Madrasa by the name of al-Mustansiriyah , we will first review the background to how learning institutions thrived in Muslim lands. Following the establishment of Seljuk rule, Muslim lands experienced a considerable rise in the number of scholarly institutions, which were largely sponsored by the powerful and wealthy elite. Hence, in Iraq it was the Vizier Nizam al-Mulk (d. 485H/1092 CE) who both founded and took responsibility for the spread of Madrasas within his jurisdiction. Originally from Tus, he was the compatriot and friend of al-Ghazali, who himself taught at the great Madrasa, al-Nizamiyya of Baghdad. Al-Mulk founded the Madrasa system within Baghdad towards 459H/1066CE, and was then responsible for the spread of such institutions to the more Eastern parts of the Muslim World. According to Abu Shamah, ‘the schools founded by Nizam al-Mulk are very famous all over the world. No single village lacks one of these schools”. The state exercised some supervision over teaching, such as that at the Nizamiyya, where the permission of the Caliph  had to be obtained before a teaching post was occupied. Following Nizam al-Mulk, it became a practice, or rather a competition between rulers, to build more Madrasas. Nur ad-Din, who ascended to the throne in 541H/1148 CE, founded many such institutions in Damascus and the other large cities of his kingdom. In Egypt, Salah ad-Din founded five colleges in Cairo, followed by over twenty six other such Madrasas that were established by both his followers and later Mamluk sultans . Individuals did the same. A Madrasa for women was established in Cairo in 634H/1237 CE by the daughter of the Mamluk Sultan Tahir, while Khatun, the daughter of Malik Ashraf constructed a women's Madrasa in Damascus; yet another such Madrasa was founded by Zamurrad, wife of Nasir ad-Din of Aleppo . The spread of the Madrasa was so rapid that at some point in the medieval times, according to Tawtah , there were 73 colleges in Damascus, 41 in Jerusalem, 40 in Baghdad, 14 in Aleppo, 13 in Tripoli, 9 in al-Mawsil and 74 in Cairo, in addition to numerous institutions in other cities. A later author, writing around 1,500, counted about 150 Madrasas in Damascus alone . At some point, the whole of the Muslim lands with the exception of Spain and Sicily was just a wide, dense network of colleges, of varying sizes, providing education to tens of thousands, maybe hundreds of thousands of pupils, at a time, when education in Europe was the privilege of a minority of clergy or the top elite, certainly not exceeding the few hundreds. Jerusalem had a great number of famous institutions, described in great detail by the late medieval scholar, Qadi Mudjir ad-Din (d. 918H/1521 CE) . Inside al-Aqsa Mosque, near the women's area is the Madrasa Farisiya founded by Emir Faris ad-Din al-Baky. There were also the Madrasas Nahriya and Nasiriya. The latter was named after the Jerusalem scholar, Sheikh Nasr, before it became known as the Ghazaliya, after the famous scholar al-Ghazali, as it was a place both of his residence and employment. Outside al-Aqsa Mosque were the Qataniya, the Fakriya, al-Baladiya and the Tankeziya. The latter, says Ibn Mudjir, is an immense Madrasa, situated on the Khatt road (it is also worth noting that the founder of this Madrasa Emir Tankiz Nasri, vice ruler of Syria, was also responsible for building the aqueduct for the water supply of Jerusalem). A number of the Madrasas within and around al-Aqsa Mosque were built by Turkish women. For example, the Madrasa Othmania was constituted in waqf by a woman belonging to one of the greatest families of the country, Isfahan Shah Khatun in the year 920H/1523 CE. Earlier, in 751H/1354 CE, the Khatuniya Madrasa was constituted in waqf by Oghl Khatun, daughter of Shams ad-Din Mohammed ibn Sayf ad-Din of Baghdad. This Madrasa itself was financed by the local businesses . Figure 2. A Qur'an manuscript written in Kufic script and early sample of a paper. Picture copyright from: 1001 Inventions: Discover the Muslim Heritage in Our World. Chief Ed. by. Salim T S Al-Hassani, Manchester: FSTC, 2006. ‘The Mustansiriyah was founded in 631 H/1234 CE by Caliph al-Mustansir. He was the penultimate Abbasid Caliph, the father of al-Mustassim, who was later to be put to death by Hulagu. It was located immediately south of the Gharabah gate, on the shore of the Tigris. It was built as a large two storied structure. In its outward appearance, and its internal sumptuousness and wealth, the Mustansiriyah surpassed all that was previously seen in Islam. It was oblong in shape with a great open court in the centre. Around the courtyard there were rooms for teachers and students, opening out to arched cloisters. Nearby, the Great Mosque of the Palace (Jami al-Kasr) was also restored by Mustansir, who also restored the four platforms (Dikkah) on the Western side of the pulpit. There, the students sat and held their disputations after the Friday public prayers. The remains of this Mosque are still in existence. ‘At the Mustansiriyah, professors received monthly salaries, and the three hundred students each received one gold dinar a month. The college had large lecture halls, where students were taught by a head professor and his assistants. There were also small tutorial-like classes, with a teacher for ten students. Students studied subjects that included the traditional linguistic, legal and religious subjects, but also arithmetic, land surveying, history, poetry, hygiene, the care of animals and plants and other phases of natural history. There was also a course in medicine with a physician in charge. ‘The Mustansiriyah included major facilities. It had a very large library, staffed by a librarian with an assistant and attendants. According to Ibn al-Furat, the library (Dar al-Kutub) had rare books dealing with various sciences, and made available easily to students, either for consultation, or copying. Pens and paper were supplied, and so were lamps and provision of oil. The students also received medical care and financial aid, in addition to free tuition. Daily rations of bread and meat were also provided to all inmates by a large kitchen. Elsewhere in the building, were store rooms and bathing facilities (hammam). Also attached to the college was a hospital with a dispensary and rooms for teaching medicine. One of the rarities of the Mustansiriyah was its famous clock, set in a design of the heavens, with twelve doors, each opening to announce the hour. Figure 3. A sulus, nesih and rik'a calligraphy by Halim Özyazici (1898-1964). Muhittin Serin's Hat Sanati ve Meshur Hattatlar (Calligraphy and Eminent Calligraphers), Istanbul 2004. ‘The Caliph al-Mustansir himself took such great interest and passion in the work of `his' institution, that he inspected it nearly every day. He also had a belvedere (Manzarah) overlooking the college, with a window opening upon one of the college halls, from where he watched the building, and heard the lectures of the professors and the disputations of the students. Just a century after its foundation, Ibn Battuta, who visited Baghdad in AH 727 (1327 CE), speaks of the magnificence of the place, which miraculously, had escaped the Mongol sacking of Baghdad (in 1258 CE). He states that lectures were still provided. Twelve years after him, the geographer Hamd Allah also refers to the Mustansiriyah as the most beautiful building in Baghdad. Given Islam's love for knowledge and its elevation of scholars and writers to exalted positions, the evolution of a publishing industry was a natural result of the advent of Islam . Within one hundred years after the advent of Islam, a sophisticated and highly integrated book industry was flourishing in the Muslim world. Techniques were evolved for each stage of book production: composition, copying, illustrating, binding, publishing, storing and selling. Reading books, as well as hearing them being dictated, became one of the major occupations and pastimes. In certain major cities, such as Baghdad and Damascus, almost half the population was involved in some aspect of book production and publication. However, book production was both an industry and an institution, an institution with its own customs and practices, its own checks against fraud and misrepresentation and, above all, an institution that ensured that learning and books were not the prerogative of a select few but were available to all those who had the desire. It also ensured that the scholars and authors themselves also benefited from their work, both economically and in terms of recognition . For a summary on the role and impact of the Madrasa: -George Makdisi: The Rise of Humanism in Classical Islam and the Christian West; Edinburgh University Press, 1990. -B. Dodge: Muslim Education in the Medieval Times; the Middle East Institute; Washington D.C; 1962. Ibn Jubayr in J. Pedersen, The Arabic Book, translated by G. French, Princeton-New Jersey: Princeton University Press, 1984, p. 128. Quoted in A. Shalaby. History of Muslim education, Beirut: Dar Al Kashaf, 1954, p. 58. A. S. Tritton: Muslim Education in the Middle Ages. London: Luzac and Co. Ltd., 1957, p. 91. 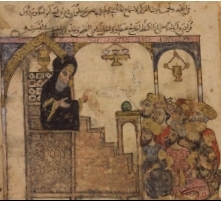 Bayard Dodge: Muslim Education in Medieval times; op cit. ; p. 22. S. M Hossain: A Plea for a Modern Islamic university; op cit. ; p. 100. Bayard Dodge, Muslim Education in Medieval Times; Washington D.C.: The Middle East Institute, 1962, p. 23. J. Pedersen: The Arabic Book, p. 128. Mudjir Eddin: Al-Euns al-jalil bi Tarikh el-Qods wa'l Khalil, translated into French as Histoire de Jerusalem et Hebron, by H. Sauvaire; Paris; Ernest Leroux; 1875; and 1926; pp. 140 fwd. A. Shalaby: History, op cit., pp. 65-67. Ibn Jubayr: Al-Rihla, The Travels of Ibn Jubayr, Tr. R.J.C. Broadhurst, Jonathan Cape, 1952, p. 284). A. Shalaby: History, op cit., pp. 65-7. Yaqut: Irshad al-Arib ila Ma'arifat al-Adib, or Muja'am al-Udaba (Dictionary of learned men,), edt. D.S. Margoliouth (Luzac, 1907 ff), Vol.V, p. 231, Vol VI, p. 343. Ma'ruf, Naji, al-Madrassah al-Mustansiryah, Nadi al-Muthanna, Baghdad, 1935. B. Dodge: Muslim education, op cit., pp. 23-4. M. Nakosteen: History of Islamic Origins of Western Education: 800-1350. Boulder-Colorado: University of Colorado Press, 1964, pp. 50-1. E. Gibbon: The Decline and Fall of the Roman Empire. J. M. Dent, 1962, vol. 6; 1925 ed. ; pp. 28.